Originally published under the title "Inshallah, Happier Together!" 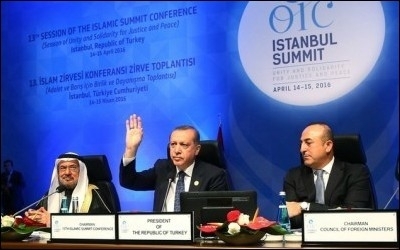 President Recep Tayyip Erdoğan at the Organization of Islamic Cooperation (OIC) summit in Istanbul on April 15. Hopefully, the third 1,400 years of tumultuous future will finally bring some peace. Ironically, every Muslim leader complained of the sectarian "fitna" that has caused millions of Muslim deaths in Muslim lands, many in the hands of "the right sect." Unsurprisingly, no one explained which Muslims were engaged in that violent "fitna." Time for peace – until the next bomb kills heretics praying at the wrong mosque. Every Muslim leader complained of sectarian 'fitna,' without explaining who is responsible for it. In reality, the summit featured an extremely oxymoronic slogan for a gathering of this sort: "Unity and Solidarity for Justice and Peace." In all reality, we can talk about rare – often, à la carte – "sectarian" unity and solidarity, selective justice, and almost no peace. Despite sharing a common sect, Sunni Muslim countries like Turkey and Egypt sport "divided-we-stand" societies in addition to deep non-sectarian rifts with same-sect countries. Prime Minister Ahmet Davutoğlu's call "to liberate all Islamic lands under occupation, especially Palestine and including Karabakh and Crimea," must have caused laughter spasms in many capitals, especially in Moscow. Imagine a mighty Islamic army at the gates of Crimea: Why did you bother to come all the way? We'll liberate Muslim Crimea from occupation. Welcome, gentlemen; do you want the liberated Crimea in standard or gift wrap? Meanwhile, President Recep Tayyip Erdoğan thinks that "We [Muslims] should break the isolation of our [Muslim] brothers in the Turkish Republic of Northern Cyprus." He did not say, though, how come in all the fancy talk of Islamic unity not a single Muslim nation (apart from Turkey) recognizes the breakaway Turkish "statelete" in Cyprus. Not even one! Mr. Erdoğan claimed that the only road to sustainable peace in the Middle East is to "end the occupation [of Palestine] and the establishment of an independent Palestinian state with eastern Jerusalem as its capital," a miracle formula that will end the 14-century-long fighting in this part of the world. Apparently the president does not wish to remember that the days of fighting at the time of Quraysh started about 14 centuries before Jerusalem was "occupied." Imagine: Jerusalem has been liberated and the first thing that happens after is the Iranians and Saudis rush to each other's capitals and kiss and hug each other, while the Islamic State of Iraq and the Levant (ISIL) and an assortment of other jihadist groups disband themselves, apologize for their past brutality and become peaceful citizens of a democratic Syria, and their comrades in Pakistan and Afghanistan start chanting songs of peace and democracy. Turkish Islamists have always had a confused mind about "foreigners" (read, non-Muslims) intervening in their own (Muslim) affairs. That confusion still prevails. Mr. Erdoğan powerfully reminded Muslim leaders that "we, not others, should resolve our disputes including terrorism" because "when they intervene they intervene for oil." Why, then, has Mr. Erdoğan been a very keen supporter of the idea that the world powers, most notably the United States, should bomb Syrian President Bashar al-Assad's regime in Damascus? Did he want the Americans to get Syrian oil by intervening? Why can we not resolve our disputes in the case of the Syrian civil war? Why is Turkey part of an international alliance including "them" in the campaign against ISIL? Why did Mr. Erdoğan so passionately call on western states to isolate Egypt's Muslim president, Abdel Fattah al-Sisi? Why did he support the allied (non-Muslim) occupation of Muslim Iraq in 2003? For oil? Perhaps the first thing Muslim leaders should understand if they really want to resolve their problems without intervention from the "others" is that they must abandon – totally abandon – their various flavors of Islamist polity and their supremacist adherence to their own sects, religion, and ethnicities. That could be a good start if they want to have a less tumultuous 1,400 years ahead.